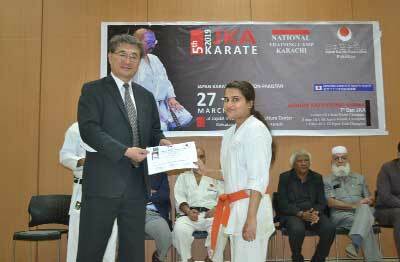 Toshikazu Isomura Consul General of Japan in Karachi hosted “Karate Workshop 2019” during the reported week at the Japan Information and Culture Centre in cooperation with the Japan Karate Association (JKA). Karate is one of internationally recognized martial arts originating in Japan and has become popular in Pakistan. Now it is believed that there are around 40000 Karate players in Pakistan. Also, Karate will be included in the Olympic event from the Tokyo Olympic Games 2020. In such a historic moment, the workshop, with the presence of Katsutoshi Shiina, a leading Karate player from Japan and JKA official instructor, 7th Dan will offer opportunities not only for the participants to enhance their martial arts skills but also for people of Pakistan to explore the fun and excitement of Karate. It will also promote the recognition of Karate as a new Olympic sport in Pakistan and enrich the cultural relationship between Japan and Pakistan. During the two-day workshop, around 50 Pakistani Karate players participated in the training sessions and challenging for Kyu or Dan promotion tests. The Consulate General of Japan considers it important to establish relationships between Japan and Pakistan in various fields. The “Karate Workshop 2019” will contribute to development and strengthening of ties through the Japanese traditional martial arts “Karate” and enhancement of cooperation in sport sector towards the Tokyo Olympic Games 2020. Gradsy Institute during the week presented Best performance Certificate in honor of Kamran, who is the owner of MAK Collegiate, a successful project of hard efforts of Kamran and his associates. Kamran has so far taught more than hundred thousand students. He has been in education field for over three decades. He has always been keen in providing best education to students. He is highly educated person and much inspired with the vision of Quaid-i-Azam and Allama Muhammad Iqbal. 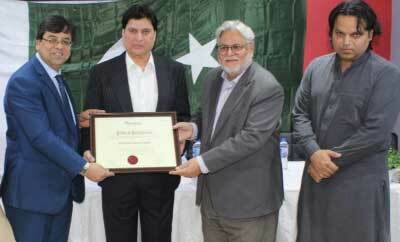 Veteran cricketer Mohsin Hassan Khan, and member Board of Governors Gradsy Institute awarded Pride of Performance to Kamran. Ateeq Ur Rehman Executive Director AMTF was Co-Chief Guest of the session. He appreciated Mohsin Hassan Khan and Kamran for their valuable contribution to the nation. Chairman Zakir Ahmed appreciated all the guests and members Board Gradsy. 7th meeting of Aaghosh Trustees was held during the week in which 8-point agenda including arrangements facilities to the residents of Aaghosh and planning to organise fund raising events in connection with holy month of Ramazan were discussed. Shagufta Saba President, Shehla Ahmed Vice President, Muhammad Jazib Secretary General, Miraz Haider Baig Finance Secretary, Dr. Kauser, Manzar Naqvi Trustees attended the meeting. Renowned Journalist Agha Masood Hussain also participated in the meeting as observer and gave his valuable suggestions to the trustees to improve the services being rendered by the Trust for the shelterless and helpless women. He also lauded meritorious services of Shagufta Saba, Shehla, Jazib and Dr Kausar for the Trust. 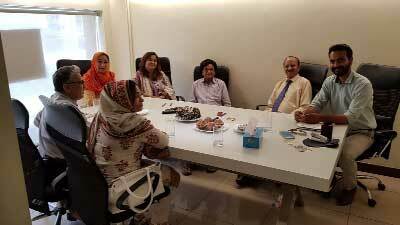 At the end of meeting all trustees celebrated birthday of Mirza Haider Baig, Finance Secretary of the Trust. Generation’s School (Middle Section) celebrated its showcase theatrical event Genorama during the week with great zeal and fervor. All students of grade IX took part with great enthusiasm. On this occasion the chief guest, a visionary parliamentarian, Ghazala Saifi appreciated the rising talent and applauded them with great pride. Ghazala Saifi is currently serving as a Secretary National History and Heritage. She is the member of profound committees, Federal Education and Skill Development, Kashmir and Human Rights. Ms. Sadia Ashar, in her welcome note, highlighted the importance of theatre and talked about the importance of the event’s theme. She further advised students to make use of all available resources to showcase their talents. The theme of the event was “diversity” highlighting the strenuous efforts of the Generians to symbolize perfection, hard work and acceptance. Every piece of art was a reflection of diversity in thoughts, ideas and actions, Apart from the talent on stage, students of grade IX took charge, in guidance of the teachers, of every aspect including backstage, art work, media and I.T., makeup, costumes and transitions to name a few. Principal of Generation’s School, Dr. Ghazala Siddiqui highlighted the School’s values and the vision and the alignment of such events with the School’s objectives.